Elicser and Other, Alexandra Park. Photo by Pascal Paquette. Persue, Rush Lane. Photo by Pascal Paquette. Poser, Rush Lane. Photo by Pascal Paquette. Sohoe, Markham Street. Photo by Pascal Paquette. Faile (New York), Bathurst Street. Photo by Pascal Paquette. Art Child, on Adelaide Street just east of Bathurst. Photo by Pascal Paquette. Birdo, Queen Street East. Photo by Pascal Paquette. Bacon, near Ossington. Photo by Pascal Paquette. Lexr and Evoke, Queen Street West. Photo by Pascal Paquette. Rons, mobile piece (seen near Queen Street West and University Avenue. Photo by Cindy Blažević. Aaron Li-Hill, Parkside Drive. Photo courtesy of the artist. Wysper, Parkdale. Photo by Pascal Paquette. Uber, Rush Lane. Photo by Pascal Paquette. Jaroe, Adore and Bort, Rush Lane. Photo by Pascal Paquette. Faith47 (Cape Town), Evergreen Brickworks. Photo by Pascal Paquette. We handed over our Instagram account to Toronto artist Pascal Paquette last week, and from Sept. 10 to 13 he travelled around Toronto’s street and alleys capturing new street art and graffiti work, both commissioned and sanctioned, along with classic works from recent years. The 15 photos he shared with our followers are evidence of Toronto’s thriving street art community, which provides fertile ground for Toronto talent and attracts accomplished artists from around the world. Many thanks to Pascal for the tour and to all the artists who’ve brightened our city’s streets with these projects. Pascal Paquette is primarily a fine art painter, and also uses street art, graffiti and photography in his site-specific projects. His art has been exhibited, commissioned and published internationally and locally, notably at the Museum of Contemporary Canadian Art (MOCCA) and the AGO in 2012, when he and Sean Martindale presented their collaborative installation NOW. He lives in Toronto, Canada, and posts to Instagram at @pascalpaquette. Chou (aka Pascal Paquette) on Camden Street, Toronto. Toronto artist Pascal Paquette is taking over our Instagram account from Sept. 10 to 13. He’ll be roaming Toronto streets to post pics of street art and graffiti, both commissioned and sanctioned works produced mainly this summer, along with classic works from recent years. Follow @agotoronto and #agofieldtrip to see the photos, then find the geo-mapped locations and experience the pieces in person. We think Warhol would have approved too – in 1984 he was turned into a zombie himself by famous make-up artist and scare-man Tom Savini! We invited the amazing Cassandra Carter from Sculpture Supply Canada to demonstrate how to create the look. This is a basic tutorial, suitable for wannabe zombies of all abilities. Costume – we got everything apart from the wig from a thrift store. Makeup – available from Sculpture Supply Canada or similar store. Start by attacking your blonde wig with a comb and scissors to recreate the iconic Warhol look. We found turning the wig backwards worked really well! One you’ve created the shape you want, put the wig to one side so you can start to do the make-up. Now is also a good time to make sure your model is clean shaven (men), exfoliated and moisturized. Time to crack open the Wound Kit. This kit isn’t too expensive and contains everything you need to recreate realistic gory wounds. There’s even detailed instructions in the box. It helps to draw out the kind of wounds you want beforehand or use pictures for reference. We went for some detail around the mouth and nose – the key with silicon is that less is more. It sticks to itself, so it’s better to start small and build up. Keep your wounds asymmetrical and they’ll look more realistic. Once you’ve used the silicon to create the shape of the wounds you can then start adding makeup. Apply the base colour you want to the face, not forgetting to work it into the hairline. We used Ben Nye blue spirit for a grey, undead-ish tone. Apply contour shades and highlights, building up darker tones around the eyes, nose and mouth. Then use powder to set the makeup. Once the base is done you can start adding the finer details. The FX palette can be used to create veins, capillaries, rotted skin, fungus, bruises or anything else you can think of. Add distress marks around the eyes, nose and mouth to give a sense of decay. Use the red lip-liner in the water lines of the eye to make them look bloodshot. You can also use the black stipple sponge and a darker cream foundation in various areas to make the face look even more rotten. The trick here is not to get too carried away with too many colours or things going on – keep it simple! Use the black eyeliner to recreate Andy Warhol’s dark, bushy eyebrows. If you make a mistake, use Q-tips to fix it. Blood time! Grab your fake blood. We kept our blood subtle (we didn’t want to drip on the artwork) but if you wanted to go wild here, you could. It’s really up to you! Once you’ve added the fake blood all you need to do it add in the wig and glasses. One zombie Andy Warhol! Don’t get too carried away with too many colors or too many things going on. On Saturday August 13 2011 over 60 people took part in ‘A Heart to Art Chat at the AGO’. It was a special event for people to listen, learn and co-create ideas for the Gallery. The event took place in our new Weston Family Learning Centre –a first chance for most of the attendees to spend time in the space. Taking part were members, casual visitors and even people who had never visited the Gallery before, people from a wide range of ages and from a diverse mix of backgrounds. Those who wanted to join in the conversation online were able to take part on Twitter using the #AGOChat hashtag. The day was structured like an Unconference – an event that lets the people taking part decide what should be talked about. We asked people what community groups they identified themselves with and what they would like to see at the gallery. They shared their answers on brightly coloured sticky notes which were then sorted to identify common themes. People talked passionately about their ideas for their AGO. From date nights and reality TV shows to longer opening hours and more events for adults the ideas flowed thick and fast all day. We also managed to get #AGOChat trending in Canada, so a big thank you to everyone that tweeted throughout the day. We’re in the process of gathering all the information generated from the day. Once it’s ready we’ll be publishing it online so that everyone can see what we talked about and we can report back. We think (and from reading your tweets we know you do too) that the Unconference was a fantastic way to share ideas and generate excitement for the Gallery and its programs. The success of the Unconference has us looking at new ways to communicate and gather input and we’ll keep you posted on future opportunities. Loads of great ideas came out of the social media session, like the adult sleepovers and the desire for a more conversational approach. We’ll definitely be planning a tweet-up soon and we’re also going to be building a loyal army of Twitter followers who want to volunteer to help spread the word about what’s going on in the Gallery. We want you to continue using the #AGOChat hashtag on Twitter to share your ideas as well as commenting on this blog post. We’re on Twitter @AGOToronto and you can also chat with our Social Media and Internet Content Coordinator Holly on Twitter or via email. We are grateful to everyone who came out and shared their ideas with us. Thanks also needs to go to Celina Agaton who organized the event and all of the facilitators who ran the sessions: Marisa Gelfusa; Marco Campana ; Aerin Guy; Darcy Higgins and Ramy Nassar. The Weston Family Learning Centre Gallery School Hall of Fame: Who would you nominate? The AGO’s Gallery School was started by Group of Seven painter Arthur Lismer in the 1920s. It has been a hub of art learning for millions of adults and children ever since. We know from our blog post ‘Were you a gallery student‘ that you have lots of fond memories of visiting the Gallery School in the past. Do you know of any prominent Canadians, celebrities or artists who taught or took courses at the Gallery School? Perhaps they attended camp as a child? Perhaps they took an evening printmaking class as an adult? We’re developing a Gallery Hall of Fame as an exciting way of sharing our history with our visitors. If you can think of anyone who should be on the list please get in touch or leave a comment below. The launch of our brand new Weston Family Learning Centre is now just weeks away and our Fall Program Guide is out. Find out more about adult classes at the AGO. 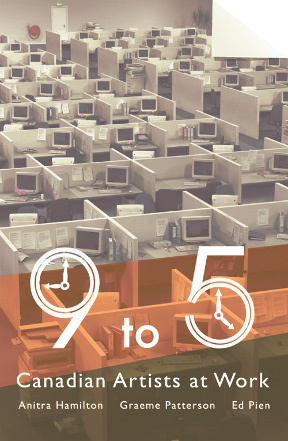 9 to 5 opening soon at the Art Gallery of Ontario! Art is work. Hard work. 9 to 5 is an exhibition that lets visitors experience art in an unexpected way: by interacting with the artists while they make it! Running from April 27th to the 29th, 9 to 5 will transform one gallery at the Art Gallery of Ontario(AGO) into a live office space. For three days, contemporary Canadian artists Anitra Hamilton, Graeme Patterson and Ed Pien welcome AGO visitors to meet with them and enjoy a conversation about their artistic practice. Using the familiar setting of the office, 9 to 5 will create a space for collaboration, inspiration and a forum for new knowledge and understanding about the artistic process. In addition, the artists have been invited to select a work of their choice from the permanent collection to “decorate” their cubicle. Accessible and interactive, 9 to 5 is an experience not to be missed! Want to know more about whats happening at the 9 to 5 office or ask the artists a question about their research process? Visit the blog here. Following the exhibition, on April 30th, will be a free, one-day symposium entitled Art/Work. The first half of the symposium will feature 9 to 5 artists and curators reflecting on the project, followed by a special presentation by curator, artist and educator Rebecca Duclos. Duclos will expand on the burgeoning topic of artists’ research.